The Tvan is easy to tow with the right vehicle. 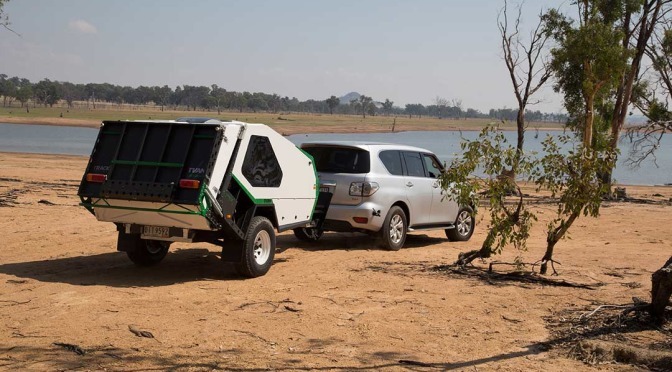 Your vehicle needs to be able to tow 1600kgs and have a minimum ball weight (without a weight distribution hitch) of 130kgs+ (Mk3) or 200kgs (Firetail). Because the Tvan weighs about 1000kgs it has electric brakes on board. These need a brake controller. If you already have one set up in your car that’s great – if not we have one fitted to the Tvan so that a standard vehicle can tow it. The trailer wiring has a standard 7 pin flat plug. We may be able to provide an adaptor if your vehicle is different but make sure you let us know in advance. The Tvan battery is recharged by the solar panel on the roof but can also be charged from the tow vehicle if you have a 50A Anderson plug available. The Tvan uses a special DO-35 tow hitch – you’ll need to remove the standard towball before coming to pick up the Tvan. Sometimes it’s really hard to remove the old towball because it’s rusted on or the thread had been bashed on rocks – it will greatly speed things up if you can remove it at home. We also require that any hirer or driver must be 25 years or older and have a valid Australian license – see the hire agreement for more details. We’ve fitted a Sensatyre TPMS to the three Tvan tyres – this uses internal rim mounted transmitters so they don’t get damaged or in the way while inflating/deflating tyres. The receiver comes with a windscreen mount and cigarette lighter plug. We have a set of 4 x valve mounted transmitters that can be hired as well to monitor your car – these are $50 for the first week and then $25/week. If you decide to buy a Sensatyre system through us within 1 month of the hire finishing we’ll apply the TPMS hire fee as a discount! (valve transmitters subject to availability). They are a great Aussie made product which stops stones from the tow vehicle being flicked up and hitting the Tvan. While the Tvan has large stone deflectors fitted, we’ve found that with some vehicles they still manage to hit the front up high. Use of the Stone Stomper is mandatory for trips involving lots of dirt roads and optional if you’re mainly on the tar. The Stone Stomper also protects the back window of the tow vehicle from stones – we have heard reports of stones flicking up from the ground, hitting the camper trailer/caravan behind and bouncing forward into the rear window, breaking it.